It’s common for older adults to experience what we call “senior moments” – temporary lapses of memory that occur while completing common, everyday activities. This can include misplaced keys, losing glasses, forgetting where you parked your car, or leaving a shopping list at home. These mental glitches are usually associated with aging and should not cause much concern. However, when problems with memory begin to interfere with the ability to function normally at home or start to disrupt everyday life and put you in a dangerous situation, it may be time to seek help from a medical professional. Alzheimer’s disease is a type of dementia that causes problems with cognitive thinking, language, behavior, and memory. It is the most common form of dementia among the elderly, with symptoms that gradually worsen over time. Certain factors can increase the risk of developing Alzheimer’s disease, such as age, genetics, high cholesterol or blood pressure, diabetes and stroke. While there is currently no cure for Alzheimer’s disease, recognizing the early signs can result in a proper diagnosis, allowing treatments to begin that can improve overall quality of life for your loved one. Memory issues that disrupt daily life should not be ignored. If you find your loved one is relying on you more regularly for appointment reminders, forgetting very recently learned information, or repeatedly asking the same question after you’ve just answered it, know that these are some of the most recognizable signs of dementia or Alzheimer’s disease. Your loved one may have trouble finding words to describe an object or feeling, or may struggle with writing. A common Alzheimer’s symptom is the inability to follow along in a conversation or successfully express a thought. Sometimes those with Alzheimer’s find familiar surroundings suddenly foreign and insist they’ve never been there before. Or, they may forget how to get to places they visit often, like the grocery store or pharmacy. It’s also common to express confusion over the day, date, month or the current season. Confusion with time and space also leads to difficulty driving to familiar locations. Or, your loved one might have problems with everyday tasks such as cleaning, balancing a checkbook or cooking dinner. If they do complete such tasks, you might notice mistakes, bills being paid late or expired food in the refrigerator. Your loved one may fall victim to senior scams, or begin making poor financial decisions. Perhaps you begin to notice a change in his or her grooming or hygiene habits, or dressing inappropriately for the season. Once you recognize these signs the sooner you seek medical attention and determine the cause, the better quality of life your loved one can enjoy. 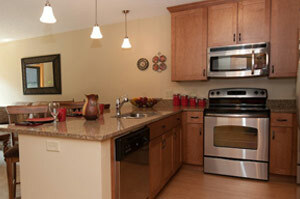 Explore the memory care community at Thorne Crest today. For more information about senior living near Albert Lea, MN, and our senior living options, contact us today at 507-373-2311.